file - A Syrian army soldier looks at his mobile as people visit the ruins of the historic city of Palmyra ahead of a musical event at its amphitheater, Syria, May 6, 2016. Islamic State militants entered Palmyra in central Syria Saturday, nine months after being pushed out of the city by Syrian government troops backed by the Russian military. The Associated Press, quoting reports by a Palmyra activist group, said IS had seized a military warehouse as well as the city's northern and western neighborhoods. The militants are also pushing toward a nearby Syrian military airbase that the Russian military has been using to support Syrian forces, Reuters reported. The intensification of fighting came after IS fighters captured at least a dozen government-held positions in eastern Homs, including strategic areas around Palmyra. "IS took complete control of al-Mohur [oil] field in northwest of Palmyra," the pro-rebel Palmyra Coordination Committee said in a tweet on Friday. IS has reportedly seized a significant amount of weapons and ammunition from retreating Syrian soldiers in the area, local reports said. Syrian warplane on Friday bombarded the area in an attempt to push IS fighters back. The IS-led offensive on eastern Homs was so swift it took pro-regime forces by surprise, activists said. IS "was so quick in capturing all these areas," said Hussein al-Homsi, a pro-opposition media activist in Homs. "The [Syrian] regime forces had to retreat and perhaps regroup to fight back in some of the recently captured areas." Syrian troops took heavy casualties since Thursday, said the British-based Syrian Observatory for Human Rights, a group that monitors Syria's civil war with activists on the ground. "If the [IS] advancement continues this way, it could take control of Palmyra at any moment," said Rami Abdulrahman, spokesman for the group. It seems "IS has planned for this assault for a long time," he added. 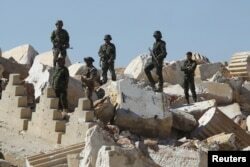 FILE - Syrian army soldiers stands on the ruins of the Temple of Bel in the historic city of Palmyra, in Homs Governorate, Syria, April 1, 2016. Syrian government forces recaptured Palmyra in March after IS controlled and destroyed key parts of the city's UNESCO World Heritage ruins. IS "is interested in Palmyra for its international importance" and it is a way for them to distract the world's attention from what is going on in Mosul and Raqqa," Abdulrahman told VOA. Analysts say with its Iraqi stronghold of Mosul coming under siege from Iraq-led forces and Raqqa, its de facto capital in Syria, being targeted by a Kurdish-led offensive, IS is likely setting its sights to create a new stronghold. IS is using the Syrian desert as a route to resupply and reinforce its fighters in Homs. The sprawling desert connects Homs to its strongholds of Raqqa and Deir Ezzor in eastern Syria. The Pentagon said on Friday a U.S. airstrike destroyed 168 oil tanker trucks near Palmyra used by IS. The central province of Homs is largely controlled by Syrian government troops. Some pockets in the north are under the control of rebels battling the regime while other areas in the east are under IS control. IS wants to move toward the central city of Homs where pro-Assad troops have been in charge since pushing out the last remaining groups of rebels in 2015. "Homs is a natural area of operations for [IS]," said Nicholas A. Heras, a Middle East researcher at the Center for a New American Security in Washington. "[IS] already has a long-established military presence in the contested areas [of Homs]."